Willing to go through the security clearance process to perform "post-security"
If this is you, please send us your request! 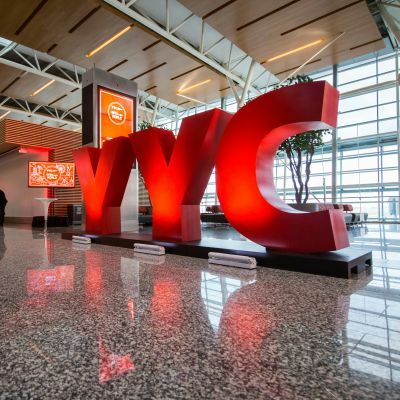 The Calgary Airport Authority is a not-for-profit organization committed to supporting our local musicians while elevating the guest experience at YYC Calgary International Airport. The YYC music program partners with Calgary-based musicians to provide ongoing performance opportunities at Calgary International Airport. The airport is a unique high-traffic environment where performers can busk for up to 1500 people per two-hour set. Two slots per day have a small honorarium and all artists receive free parking. Performances will take place post-security where guests have longer dwell times. Artists will be required to get security clearance (physical copy of birth certificate is necessary) and be expected to perform for two hours, once per week. YYC is continuously reviewing the program to ensure that it works well for the artists and guests. We are in the process of expanding our music program to include more artists and more locations.. If you are interested in applying, please ensure that your profile is up to date including links to your music, social media, photos etc. Initial selections will be made based on information provided. Please note that links to examples of live performances are preferred. Select musicians will be invited for interviews/auditions. Performances will take place at various locations in the terminal, a formal stage is not provided. A portable Bose L1 Compact System is available for artists use.